A seafront holiday home with panoramic views of Cowes Harbour and the Solent. The Watch House is a Grade II Listed Old Coastguard Boathouse with spectacular views of Cowes Harbour Entrance across to West Cowes and the Solent across to the Hampshire Coast from all rooms, garden, balcony and patio. We have redecorated the whole house for the 2019 season. This is in an ideal location to watch the large assortment of ships and glorious sunsets. The House sleeps 5 in 3 bedrooms. All bed room have sea views. The house was built in the 1880’s as part of the boat house for the coastguards. To the north is a terrace of Coastguard Cottages. During the 1920’s it was converted into a home. For a short time during the Second World War it was a munitions store and a lookout point. The Watch House is a short, level walk from the town centre, the Chain Ferry to West Cowes, Red Funnel’s Terminal or strolling along the Esplanade to a café and children’s playground and woods beyond or fishing & crabbing off the sea wall. You may see a sand piper at low tide or a Cormorant siting on the breakwater, swans and gulls. The kitchen diner has French Doors leading onto the patio; while the living room has triple aspect sash windows. There is a double, twin and a single bedrooms and bathroom with shower over the bath. The balcony is leading off the single bedroom, from here you have spectacular views of the water activities. There is no better place to be than sitting on the balcony on a warm summers evening watching the sun set with a glass of wine. very briefly - a cosy well kitted out holiday home, and the dinning table waiting for those long family meals watching the yachts in the harbour & Sea views from when you wake until you close your eyes last thing at night. The bathroom has a shower bath, a ladder towel rail, wash basin and toilet. There is a second toilet downstairs. Gas central heating, thermostatically controlled by the guests. There are wonderful waterfront views from the dining table, it seats 6 comfortably. The Television has free view channels. Small fenced garden, with flowers Lawn & patio. Wonderful 180 degree sea views and views of West Cowes and the Hampshire coast. Perfect location for the glorious sunsets and for Firework Night. Small Boats can use Bell's Landing next to Albany Green or be launched from the slipway opposite. The Patio is a wonderful place to pass a few hours over a bottle of wine or barbecue. Over looking Cowes Harbour where you can sit and watch all the brilliant sunsets, the yachts and cruise liners. Notes on accommodation: Pets are accepted, there will be an extra charge of £15 per animal, but please they are only allowed downstairs and not on the furniture. Outside: The garden includes a patio, lawn and shrubs, flowers and herbs. There is garden furniture for the patio and balcony. Seaviews. Parking is on the road outside or Albany Road a Road back form The Esplanade. Also there is a free car park along the Esplanade. Cleaning / Towels / Linen / Maid service: Bed Linen and bath towels are provided. Please supply your own beach towels. End of stay cleaning is included and a bucket of cleaning products is supplied. The property is perfectly situated, with fantastic views and very comfortable inside. This is a fantastic place to stay in a great location. The views are great and it's an added bonus to have the outdoor space with picnic table. The house is comfortable and Angela was extremely helpful, meeting us when we arrived and quickly rectifying the couple of issues we encountered. Very accommodating host, everything you could need and want for a home from home, just what the doctor ordered. Excellent house for family Christmas. Superb and interesting house which was very well equipped for us to celebrate the festive season with our family. Angela added some Christmas decorations to enhance our stay. We all, including the six year old grand child, enjoyed the outstanding views of the shipping and the Solent. The house was very warm, clean and comfortable. The owner was very helpful and friendly with excellent and prompt communication skills. This made the booking process straight forward and our stay at The Watch House problem free. Altogether we had a delightful stay at the house and would not hesitate to book again at such an interesting and individual property. As a family of five we would highly recommend The Watch House. The Wstch House is overlooking the harbour, relaxing to just watch the world go by, exciting to see the ferries coming in. Great location near the ferry means after travelling you can be making a cup of tea in five minutes. Waitrose is two mins away. The house is lovely. Clean, tidy and well presented. You can take your dog, bonus for us. Only negative from our stay is one on of the single beds has a spring that sticks in your back, so could do with new mattress. But apart from that it's a ten from us. Tennis court on the Esplanade, 5 min. walk. Sailing schools, fishing trips, water sports and yacht charters 20 to 30 mins walk and chain ferry away. Riding schools with half hour drive. Swimming pools & Cinema's Ryde and Newport. Across the road to the sea wall for fishing, crabbing and the slipway. A 5 to 10 minute walk to the shingle beach along the Esplanade or 20 to 30 minutes in a car to the sandy beaches of Ryde, Sandown and Shanklin. Car ferry to Southampton 5 minute drive or walk. Bus stop access to all the Island via Newport or Ryde; 5 minute walk. Chain ferry to West Cowes 6 minute walk. Southampton to West Cowes - Red Jet 20 min. walk and chain ferry and taxi. Lymington to Yarmouth - Car Ferry 15 miles 40 minute Drive or Bus. West Cowes 5 minutes on the Chain ferry. 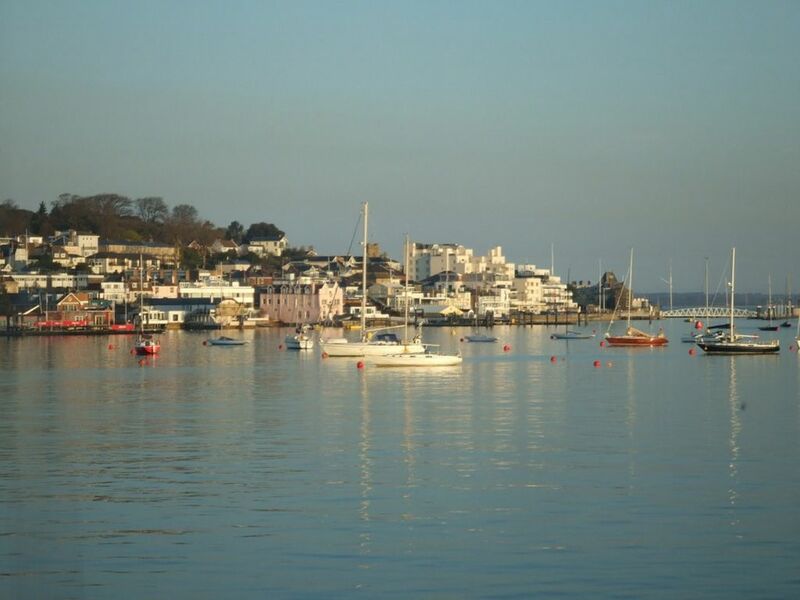 East and West Cowes have a good selection of Restaurants and cafes within walking distance. I sometimes have ferry discount offers, please ask, if you would like one Please ask for special winter rates for 2 or 4 guests Changeover Day: Change over day is a Friday. Short breaks are welcome Monday to Friday and Friday to Monday during the quiet months but not during the school holidays. Notes on prices: Please enquire for prices if you would like a longer stay during the winter months.